By examining everyday life around the world, it becomes clear that all people have the same core needs and responsibilities. The fascinating part is what fulfilling these needs look like the farther we get from home. To illustrate these global symmetries, I've created a series of large-format collages featuring photos of the same thing taken around the world. The shape of the collage is determined by the universal need itself. Within them, we can easily see all the different ways people do laundry; or build a house; or ride in a taxi; or smile; or live their lives. The Symmetry Project strives to instill a homogeneous view of our beautiful world – and inspire the wanderlust that motivates us to hop on a plane and experience it for ourselves..
25 Cents. 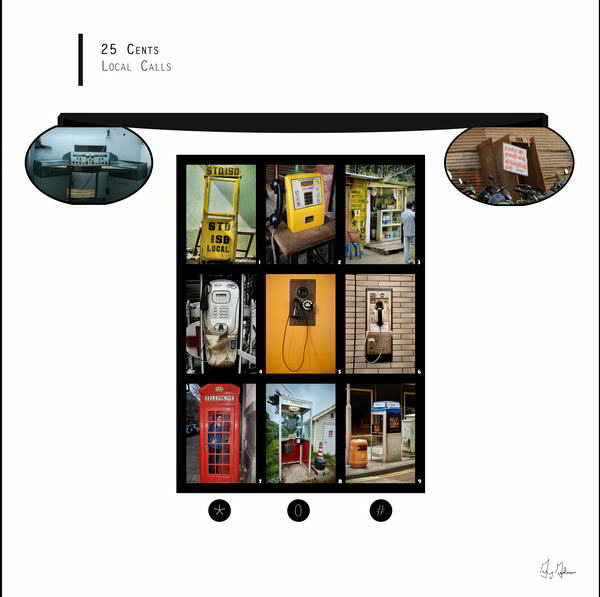 Local Calls, 2012, photographic c-print, mounted on dibond and laminated with polycarbonate, 30 x 30 in.